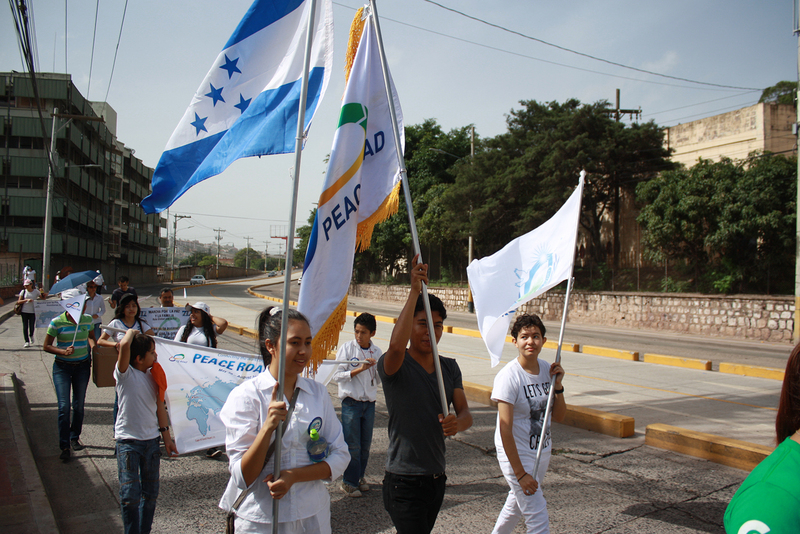 FFWPU Honduras: On June 21, we held the Peace Road march in Tegucigalpa, Honduras, with lots of participants . The fifth Central America nation. We started the march from a few blocks away from the Presidential Palace, Tegucigalpa, walked down ten blocks to the National Stadium then kept walking down to the Congress Palace, a total of 28 blocks. Honduras is in the middle of conflicts, so everyday many organizations are marching. They also call their marches “Marches of Peace.” The day before (Saturday), one of those marchers threw a bomb at the Congressional Legislative Palace. Fortunately, it did not explode. Because we also had planned to finish at the Congressional Legislative Palace, the authorities advised us to stop the march the next day and reschedule it, but we decided to do it anyway. On that same Sunday, someone else threw a bomb at the Justice Palace and it exploded. The circumstances were not easy, but under the protection of Heavenly Parent, our Peace Road march was successful. At the end, near the Congressional Palace, we celebrated the victory of our March for Peace and Family with folk music, dancing and some speeches.